I feel I am one of the people who is in the minority when it comes to the Brosnan era of James Bond films. 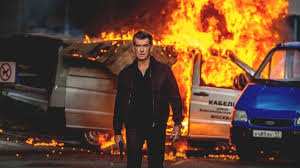 Yes, it wasn't the shining light of the James Bond pantheon, but I thought Brosnan did a good enough job to matter. The problem is that with "Die Another Day," he was working with quite possibly the worst Bond script ever, and that kind of ruined his reputation. I find it hard to argue against "The World Is Not Enough" or "GoldenEye." I do many people who hate "GoldenEye," simply because the premise felt very out-of-place with the 1990's, in the middle of 1995, Russia wasn't an enemy anymore. If those people still hate "GoldenEye," I wonder what their thoughts are of "The November Man." Imagine a Pierce Brosnan Bond movie where the history of Russia was still botched for location purposes and featured a Jason Bourne edge. At the same time, the movie was incredibly inept, predictable and dull from start to finish. Well, that's "The November Man" for you. Despite the grittier and bloodier action, "The November Man" is an uneven mess. A total riff off of the Bourne series, but told through a pitiful filter. Even though Pierce Brosnan comes at the top of his game, it isn't enough to save this ship from sinking. Pierce Brosnan plays Peter Devereaux, a CIA- assassin who trains David Mason (Luke Bracey) in the arts of governmental assassination. But David messes up, he messes up bad, and the two assassins part ways. Several years later, Devereaux has left the killing life for something simpler, but he's pushed back into the business after a undercover agent in Russia just found evidence that could tie a key Russian leader to war crimes. Devereaux agrees and on the verge of saving the agent, they get made and the agent is killed...by David Mason. The two men square off against each other, and of course, CIA corruption also ensues. Like I said, Pierce Brosnan does good work in the movie. He seems to be totally reliving his James Bond days. It's just too bad that he has such a terrible script to work from. Sure, "Die Another Day" was bad due to its suspension of disbelief. "The November Man" is just bad for being unbalanced, logically-flawed and even misogynistic at times. I am not sure how Luke Bracey got the role in this movie, but this guy should never act again. He brought each of his scenes to a horrifically loud halt. He was completely devoid of energy, passion or attention and the movie seemed to stop in motion anytime he would shamble onscreen. There is not a whole lot more I can say about this one, except that I highly recommend you stay away from it.